A single biohybrid robotic finger at work. Notice the contracting and expanding muscles at the top of the device. By growing muscles on an artificial skeleton, researchers from Japan have constructed an agile and surprisingly durable “biohybrid” robotic finger joint. The breakthrough could eventually lead to more life-like robots and advanced prostheses. Biohybrid robotics is exactly as it sounds—an engineering technique that intertwines living, biological tissue with synthetic robotics. Scientists fashion their cyborg creations with heart or skeletal muscle tissues grown in the lab, which are then affixed to flexible material and compelled to contract. 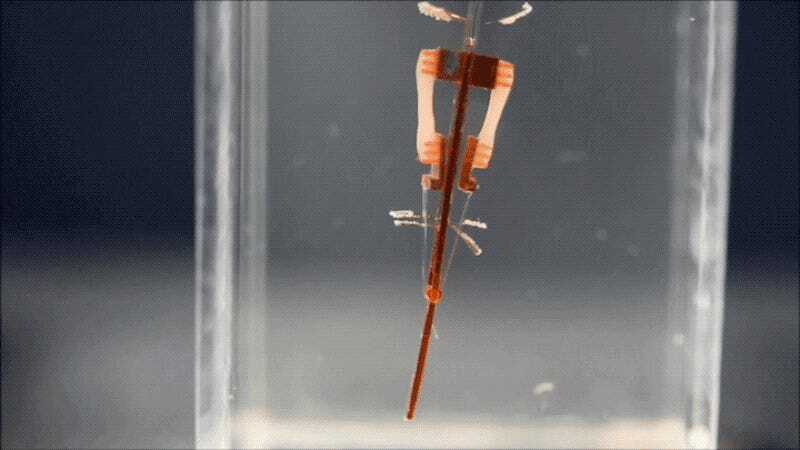 These muscles enable otherwise inanimate robotic parts to perform such actions as grasping and walking. The problem, however, is that engineered muscle tissue tends to shrink and lose function over time, typically due to overuse. As new research published today in Science Robotics shows, researchers from the University of Tokyo Institute of Industrial Science have developed a flexible finger-like robotic joint that lasts longer than similar biohybrid devices. Instead of just contracting, these muscles also expand, contributing to the system’s longevity. A team led by Yuya Morimoto and Shoji Takeuchi took a small batch of lab-grown immature animal muscle cells and placed them onto several hydrogel sheets, where they continued to grow and mature with the help of a liquid bath (the muscle cells wouldn’t have been able to survive outside of this liquid growth medium). From there, the sheets were anchored onto the robotic skeleton—but the key was to align the muscles as an “antagonistic” pair, allowing them to work opposite to one another. Once affixed to the robotic skeleton, electrodes were used to induce muscle contractions. In tests, the robotic fingers delicately placed a ring onto a target, and a pair of robots worked together to pick up a square frame. The robots functioned properly for over a week. The experiment showed that the new method works, and that the muscles could flex in a finger-like fashion at a 90 degree angle. From here, the researchers would like to combine more muscles into more complicated robotic devices. Eventually, they’d like to create other biohybrid body parts, such as entire hand or arm. The method could also lead to more biologically accurate “muscle-on-a-chip” systems used in drug development and testing. And for biologists, the technique could also yield new insights into animal physiology and function. It’ll be awhile before we have full-on cyborgs walking among us, but as advances like this demonstrate, we’re getting there, one hybridized finger at a time.